Regiment in various stations throughout the Mediterranean. Regiment in the West Indies (remains until 1814). Recapture of Guadaloupe. 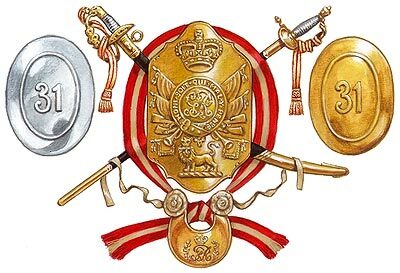 The universal shako plate for Other Ranks. On the left, the Officer’s cross belt plate and, on the right, the brass cross belt plate for the rank and file. The Sergeant’s sash has a central stripe of the facing colour. The gorget is of the universal pattern in gilt with facing colour silk rosettes and ribbons. Also shown are a Flank Company Officer’s sabre and a Battalion Company Officer’s sword. 2/31st Battalion disbanded, Colours laid up at Wrotham Park, Barnet.